We moved..or mostly Bob moved, the coop to the winter home. Issac stretched 6x6 netting over the whole yard to keep the chickens in and the hawks out. I will put a clip board in the corn barrel so we will know if the chickens have been fed that day. I have to search my basement for the heat girdle for the 5gal water pail. The big red tractor is back and is fully operational now. Bob will see if he can pull our plow thru a row of the old vineyard..or do we have to hire a company to pull the big woody roots..sumacs, multi flora rose and hawthorns...as we did last spring. We will rake leaves later this week after more leaves are down. Now that we have done the edges and found the fallen branches, the leaf raking should be easier. We need to read up on peonies. Connie would like to make a new peony row, shall we dig up what we have or buy now roots do we do that now or next spring...stay tuned for the answers to the farm's important questions. We don't need the refrigerator in the shed...do you know someone who wants one? Anyone? Please take yellow van and a few empty tubs and leaf rake to 401 main st where my office is. A tenant has raked leaves in the back and made about ten piles! Pull weeds from the pachysandra bed along sunset Ave at the creamery office building. The tall Woody weeds should be obvious..not a big job. Poles to the pole pile. If Noelia is there at that time, work with issac doing that. We are not going to the market anymore . 1. If several people are present, hitch the vineyard posts to the gray tractor and drag them three and four at a time to the post pile near the greenhouse. 2. Apply the second sowing of rye over the willow field, unless it has already been done twice. 3. Rake leaves at the fearing st side of the creamery, make piles that can be loaded into the manure spreader and spread on the willow field. 4. Bring the chestnut husks to the compost pile. 1. The deer ate spinach yesterday, if there is enough left to cut for Saturday's market do it today, before they take the rest. 2. Shuck the nuts in the cooler, put them in the refrigerator "A" in our basement. 3. Spread rye again at the sunset fields. 4. Rake leaves at the front of 136 sunset, do not rake leaves out of the pachysandra ground cover but do all the rest, I will load them and spread them at the farm at 5pm. 2. Take the lugs of dahlias and shovel over them wood chips from our big pile then put the lugs with the dahlias and chips in the 24 SP st basement. Stack them up. 3. Then rake the leaves off the grass in our back yard. Make a couple of piles . Also rake the leaves from our north side driveway and make a couple of big piles, one in front of our garage. If the manure spreader is free at noon, I will show you how we fill it and spread the leaves in the field. Put the piles where we can get to them with the tractor both at the curved front driveway and below the house, but don't block the road. 1. Put corn in the feed barrel at the chicken coop. Feed some to them. 2. Learn how to use the new seed spreader and spread rye seed on all the sunset fields. Learn how to use the spreader and how to limit the spread and the density of the seeding. Practice in the middle of the field till you learn, do not get seeds where we don't want them or we will be pulling rye weeds all next summer! We have a open bag of seeds in the yellow van and two more bags in the basement. That is more than enough for everything at sunset ave.
3. Do not let seeds fall on the perennial flower rows by the shed, the spinach rows, the rhubarb or the strawberries. You can spread them right over the top of the chard, kale, brussels sprouts and sorrel. 4. Put the two tubs of dahlia roots that are next to the big farm scale, in our basement, they will be killed if there is a frost tonight. Tomorrow we will process them for winter storage. 5. The internet instructions say dry out the bulbs for a week before storing them. So, do not put them in our basement, put them in black lugs as complete bunches, don't separate the bulbs, and put them in the greenhouse. In a week later, we will fill the airspaces in the lugs with wood chips and store the stacked lugs at 24 s property st where they won't freeze. 1. 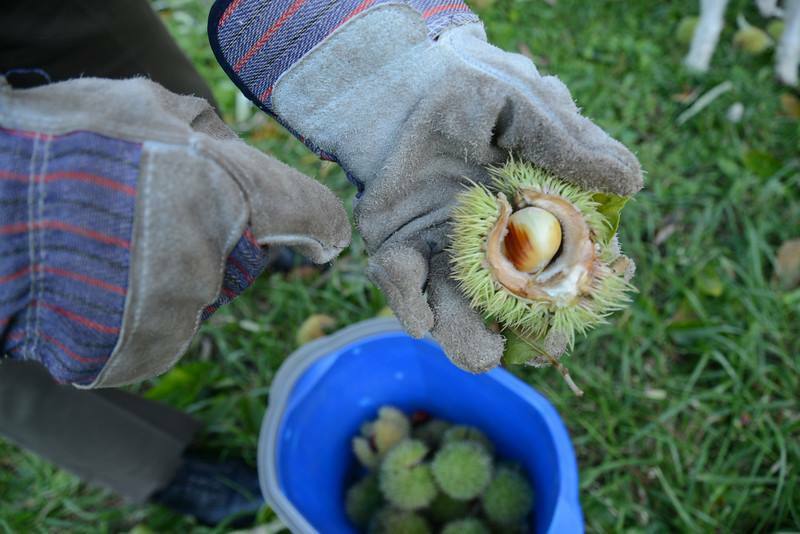 Walk thru the chestnut field first, as early as possible, and pick up nuts. As soon as we have some winds there will be a lot to pickup. 2. Pick up ALL wood stakes, stack them in the pile on the WEST side of the greenhouse. Pull off the strong 6x6 plastic mesh and roll it on a tomato stake. This is true for the flower rows left in the willow field. Most of the 6x6 is biodegradable. That stuff we will mow over, but the strong stuff can't be mowed and may be reused. 3. We are leaving the flowers that are in bloom, in case they put out new blooms this warm week. 4. We have the rye seed, I hope to receive the new seed spreader this week so we can plant rye.. when we do, do not get any seed on the strawberries, or the perennial rows. 5. Remove plastic in the willow field and the swimming pool field, using the red tractor. Put the plastic in tubs destined for a dumpster. 6. Open nut husks in the gray cooler as they dry, open only the easy ones, throw away very small husks, that will have a pea sized nut, these are garbage. Put the open nuts in a bucket and put in the silver refrigerator A in our basement. 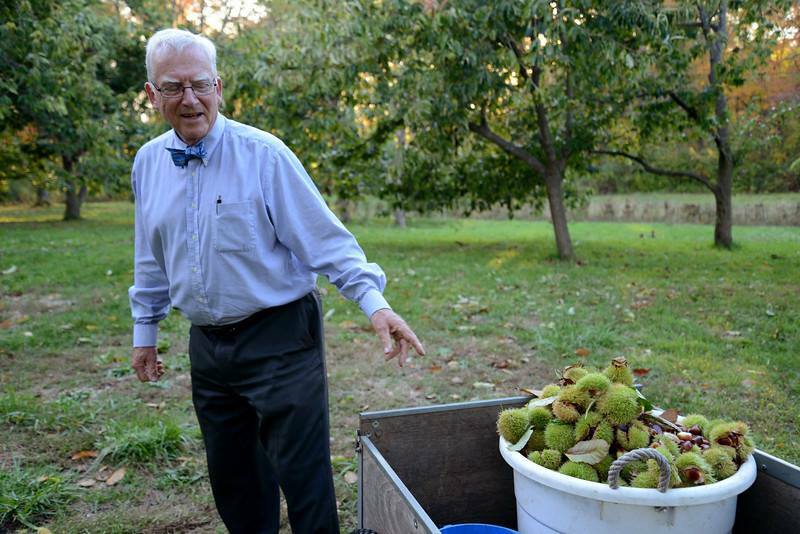 Nuts in the husk are for sale at the farm: $2.50 per pound. 7. Use the bolt cutter, remove the wires from the next row of the old vineyard. Cut the wires at each pole so they are about 20' long. Roll up the wires and put cable tie on them to keep them tight. We must get every wire out . 8. In the trunk of the blue car there is a bag of calcium nitrate which we use once a year to fertilize the spinach. Use it to side dress our three spinach rows, do not put it directly on the spinach, put it next to it. Use a hammer to break up any clumps in the bag. Wear thin plastic gloves . 9. Mow down the peppers and eggplant at univ drive. Mow down the okra too. 1. Walk around the trees and pick up nuts. 2. Cut and clean up celosia ...the brain flowers... put in the gray cooler on a shelf. Pick at least six buckets of them. 3. Stack all the wood stakes next to the greenhouse on the west side..be extremely neat in doing so. Stack full size ones, in its stack at the southeast corner of the greenhouse. 4. Pick long thin Asian eggplants at univ drive put in yellow cooler..we are getting a deep frost this weekend so this is the last pick. 5. Pick hot peppers put in yellow cooler. 6. Pick the quart or so of tomatillos from the willow field, then mow the field and lift the plastic, we will bring plastic to the dumpsters on Saturday. 7. I will get rye seed for sunset farm today. 8. Fill six tubs with manure from the old pile at university drive and dump them at the 401 main st office vegetable patch. It should be light and easy to handle it is two years old. You will need to use the yellow van. 1. 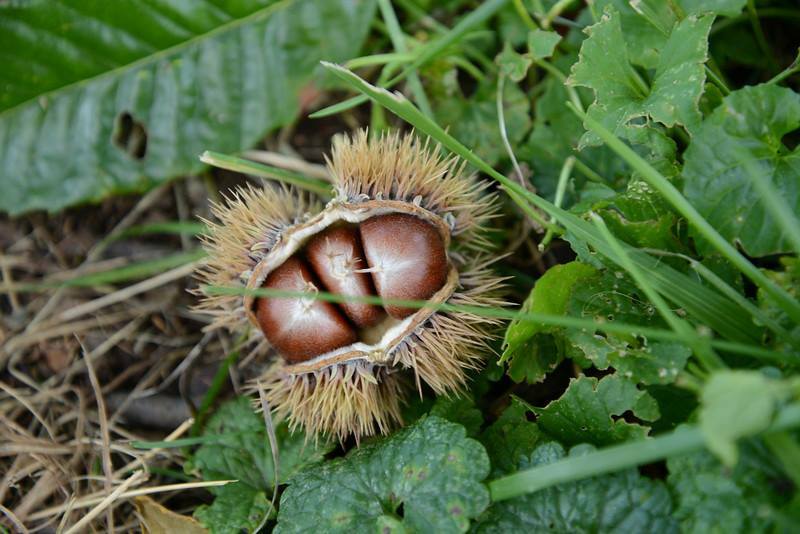 Tour the chestnut field and pick up drops first thing today, before the squirrels get there. 2. Shuck easy nuts that are in the cooler, just open the burs that have opened a bit and return the closed ones to the cooler. Hide the nuts on the high shelf in the yellow cooler. We need to save them for the market. 3. Put the gladiola bulbs that you stored, somewhere in the shed, in my basement, we cannot allow them to freeze, put them in lugs. Use the blue car if the van is gone. 4. I will set two 4x4's on the grass next to the west side of the greenhouse retaining wall for the short stakes, stack them neatly there and cover them with a tarp. All stakes will be stacked neatly and separated . The long perfect ones will be where they are stacked now and all the short ones will be lined up and stacked around the corner of the greenhouse. Both will be covered. 5. Remove the six by six netting everywhere. Put it in the barrel for the dumpster. 6. Dump a lug of dried corn into the feed barrel at the chicken yard so we can use it to feed our eggless chickens..molt time. 7. Did all the eggplant get picked? Pick the hot peppers too. 8. I will take the yellow van to be inspected at Boyden and Perron today. 1. Walk under every tree and pick up nuts. Urgent. 2. Pull up ALL wood stakes and all the tomato twine. 3. Try pulling out the 6x6 mesh from the flower rows, if it is very brittle we will have to leave it and mow it. 4. Pick eggplants unless they were touched by frost, if so they are garbage. 5. Put all nuts that are in the gray cooler into lugs, get them out of the tubs where they won't dry. 1. Knock down and pick up nuts. 2. Put nuts in black lugs and store in the gray cooler, we will shuck them on Friday before the next market. 3. Remove nuts in tubs in the cooler and put them in black lugs. 4. Remove the plastic netting from flower rows, we are not saving it. 6. See the youtube video of sunset farm posted by John Riley. 7. We have three lugs of green tomatoes, Josh said they are good for half sour pickles. They are in the gray cooler. Make some and we can offer some samples at next week's market. Do walk under the trees and pick up nuts, put them in black lugs in the gray cooler. Spray the b sprouts and broccoli. Take down wires from the old vineyard, coils the wires, then remove the poles. 1. Several tubs of chestnuts were harvested by Dylan and Vince yesterday. They are in the gray cooler. 2. In order to promote drying so the burs will shrink and open, we need them to be transferred into black lugs in the cooler asap. 3. Put plastic piles from the former tomato rows, into tubs and put into the yellow van to be brought to the dumpster at the creamery office building. That dumpster is emptied tomorrow morning so that would be ideal to get that done today. 4. It is time to spray the b sprouts and broccoli with spinosad ..capt jack.. to kill the cabbage caterpillars. Two tablespoons per gallon. This is an organic approved spray. 1. 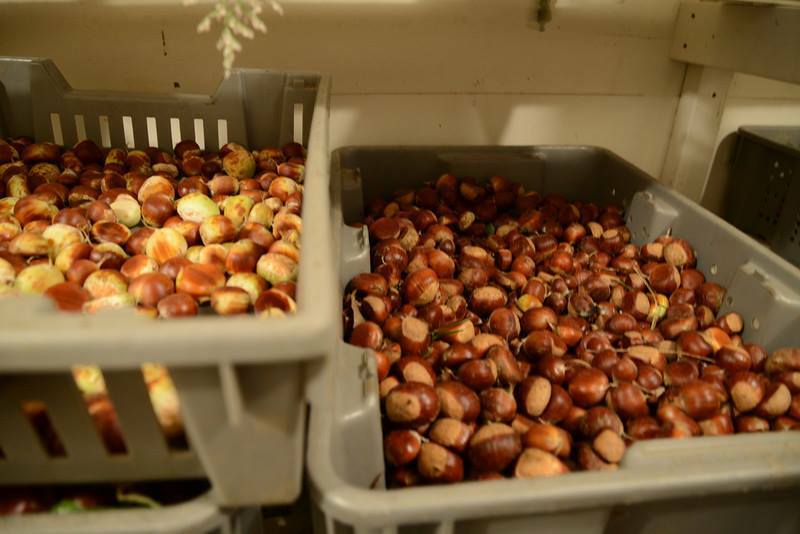 Harvest chestnuts, put them in the gray cooler. 2. Remove all stakes from the farm, don't break the long ones. 3. Where Bob has mowed, use the red tractor to remove the black plastic. Make a pile every 20' of so. Put them in tubs, put tubs in the yellow van and head for the dumpster at the creamery. That dumpster is emptied Thursday mornings early. 1. Collect nuts and burs with nuts every day. Do not worry about burs that are still tightly closed, just put them in a lug in the gray cooler, they will open as they dry out. 2. Pick up all short posts and long posts. 3. We need arborvitae trims for wreath making. If you see any we can trim let me know. The trims will keep for months. 4. Dig some parsnips for Saturday, wash them tomorrow, they are bright white for awhile after washing, begging to be chosen. 5. I have ordered 8 large new burlap bags from amazon for hanging more of the corm in the greenhouse: $ 3.50 each bag, they sell them for young people jumping races. There should be a source for used ones. I should have them tomorrow. 6. Connie is now making fall wreaths in the greenhouse. Bring up tubs of gomphrenia, they are down near the new rhubarb row. Cut an armful at a time, put them outside next to the door to the greenhouse. 1. Clean the greenhouse, vacuum it. You can leave the empty trays under the benches in the middle of the greenhouse. All around the perimeter we need to be able to see under the benches to find mouse or squirrels or chipmunk or rat holes. We need to set traps now too. 2. Pull out, by hand, the sticks supporting the flower grids. Bring them to the greenhouse. 3. Pick up the hoses at the hydrants and put them in the van, roll them up individually, tie them so they don't unroll, put them in the gray house basement. Leave the hose in the greenhouse, leave the hose at the shed. 4. Collect all the black pressure reducers that Connie the the drip tape to the hose, put them in a box with irrigation stuff in the middle shed. 1. Stack as neatly as can be done, the perfect tomato stakes that are in the trailer. 2. Be sure the stand is supplied. 3. Clean and vacuum the greenhouse, clean up that bench that has loose cobs on it. 4. Wash the pumpkins, go to univ drive and pick up perfect fully colored orange pumpkins. There should be only two more big lugs of them. Maybe more. Since pumpkins have been found to absorb bad things in your body like sugar and fat. Eat your pumpkins now and look better at Thanksgiving, who knew we had planted the perfect crop. 4 feed the red stemmed Russian kale to the chickens , they love it. 1. Harvest any tomatoes, keep the San Marzano plums separate ..they are the still green vines just east of the new rhubarb row. 2. Pick okra, favor the little ones about 3 inches long they are prime. Try taking a bite of a big one and you will see why. 3. Bok choy in the broccoli row if the willow field? 4. Be sure the squash going to market is clean, we need three lugs of butternut, all of the butter cup and two lugs of pumpkins loaded either on the trailer or in the yellow van. 5. I think the beans have been picked. 8. Pick all the bell peppers that are big..should have two or three lugs, pack them to go in the van. 9. Has celery grown after the rain? Ready for market? 10. Remove string/twine from the tomato rows put it in the trash barrels immediately. 11. Is there a full lug of potatoes, washed? Separate baby potatoes from bigger ones. Baby potatoes will sell for more. Pack them in clamshells like cherry tomatoes. Tomorrow we have Umass volunteers they will harvest and shuck the corn, pull tomato stakes, stack them very neatly behind the greenhouse. Harvest carrots, put in the gray cooler after washing. Harvest the plum tomatoes: San Marzano ones that are still growing next to the new rhubarb. Remove string from all tomatoes. Remove tomato stakes, do it using the stake extractor tool, do not wiggle them free they will break. Harvest beans in the middle of the upper field. Weed the new basil plants in the upper field. The UMASS volunteers are coming NEXT WEEK. 1. Using the big hoe left in the field at the spinach pull soil away from the spinach rows so when we cultivate with a machine, soil does not fall back over the spinach and smother it. Pull the soil to the middle of the aisle. 2. Clean up the lugs of onions in the greenhouse, throw away soft ones that are rotting. See how I did it, look at the stack of lugs in the scale shed. Put lugs of cleaned onions in the shed, we will bag them later. We need to get them out of the bright light and to remove the rotting ones asap! I say bag them later so we have another chance at that time to cull bad ones before they are bagged and sold. 3. Clean the butternut squash under the blackboard, put them in lugs in the scale shed. 4. We don't need the refrigerator, does anyone want it? 5. Weed the Swiss chard, it is embarrassing, "the chard is right over there, behind the tall weeds." 6. Go to university drive, pick up the buttercup squash. It is the best squash. Use clippers to leave a handle on it. 7. I will have the UM volunteers harvest pumpkins, corn, they will make long lines and pass the pumpkin and corn one to another and not have to walk a heavy lug over the weedy, tangled undergrowth. 8. Run the big mower over the carrot rows at the willow field to make harvesting easier. 9. Harvest plum tomatoes from the row just uphill, east, of the new rhubarb row. Thank you for weeding the new rhubarb row, it is a beautiful job. 10. Drive the rotten onions and their dead skins to the compost pile, in my next life I will not be a garbage man, no matter that it is satisfying. 1. Weed the new broccoli row in the middle of the willow field. Cover the broccoli from the deer. 2. We will install an electric wire around that row this weekend. This should be a big crop in October. Leave the wire, little white posts in the field today and I will install it tonight. 3. I am ready to forget about the beans, they will be killed in two weeks by the cold, so don't cover them. 4. Pick roma tomatoes, put in the coolers, we are racing the rot, pick the perfect tomatoes left before they get spots on them. 5. Pick green peppers, put them out at the stand. 6. Pick the acorn squash, put them in the scale shed. 7. Are there already two full lugs of carrots in the cooler? 1. Pick eggplant, peppers, three lugs of eggplant all kinds. Keep the farm stand display full, put them in the gray cooler with paper over them. 2. Wash potatoes for this weeks market put them back in the gray cooler to dry. 3. Pick up acorn squash in the willow field. 4. Gather the butternut squash into a pile in the willow field. 5. Pick tomatoes globular and plum. Put in the cooler. 6. Pick a lug of leeks trim them, put them in the gray cooler. 1. Put the onions into lugs and stack them in the greenhouse. If you feel a soft one while doing this , throw it away. Clear the benches for drying corn which will be picked by umass volunteers on Saturday morning. They will also process and pack the onions into onion bags. About six pounds per bag. $5 bags. Be extremely picky about only perfect ones. No crooked ones, no spots on them, no ugly side growths, no worm damage at the top...really really perfect ones only. Just leave the rejects in the field. Dig them up with a form or shovel don't attempt to pull them up. 3. Pick more eggplants, all kinds. Keep a lug full on the stand, put full lugs in the yellow cooler with a cover so they don't dry out. 4. Are the new broccolis in the middle of the willow field ok? Are they being eaten by deer? If so, be sure to cover them. The fall broccoli is the best. 5. Water the spinach, also pull the top 1/2" of soil away from the spinach rows about 6 inches. This will kill the weed seedlings that are about to sprout. It will also level the tiny hill either side of the furrow so that when the aisle is cultivated mechanically, the seedlings will not be buried and killed. Use a wide hoe so it goes faster. This is very easy to do, go down one side and back the other. You can do it at walking speed. 1. Pick tomatoes. Plum type and globular. Put all but one lug of each in the yellow cooler. 2. Make five bags of mixed onions. The six pound $5 bags. 3. Make sure there are prices on signs and they are taped in place. 4. Find the part of the carrot row that has big carrots. Dig the all up and then pick out and bring back to clean only perfect big carrots approximately 12" long. Smooth blemish free sides. We don't leave the small carrots growing to get bigger, dig the row up completely till you have a full lug. Wash them trim them and put them in the grey cooler with a towel or paper cover so they don't shrivel. 5. Put the onions on the benches in the greenhouse into lugs and stack them up. This weekend we will have UMASS student volunteers clean them up and bag them. 6. We will also have the students pick up butternut squash and buttercup squash this weekend. 7. They will also harvest all of the corn and shuck it. I will get 30 50 LB net bags so we can hang the corn to dry in the greenhouse again. 1. One lug each of clean butternut , butternut, pumpkins ..put in yellow van now. 2. Two lugs of eggplants, I picked them last night and they are in the van already, they are clean..leave them in the van. 3. Two lugs of leeks, put in van today you have to pull them. 4. One lug of onions in bags...( they are next to the refrigerator) one lug of large onions and one lug of loose onions, none of them to be cleaned more than 4 seconds each. Put them in the yellow van now. 5. Lugs of perfect tomatoes all kinds . At least two lugs of globular, plums and yellows. Put them in the yellow van now. 6. Pick pint clamshells of small cherry and yellow tomatoes, fill a lug put them in the yellow van now. 7. I looked at the green peppers last night, there are not enough to pick and pack. 8. Do pick a dozen pint clamshells of hot peppers a few of each kind. 9. At five I will pick more corn hopefully six lugs and I will put it into the yellow van. 10. Bok choy, fill a lug put in the gray cooler. 11. Potatoes, put in white bags then put the bags in lugs. ..do two lugs one red one white. Only perfect potatoes in each, throw away scarred and ugly ones DO NOT WASH THEM. 1. Wash carrots for the market have two full lugs of 12" ones. 2. Harvest cantaloupe and watermelons from UNIV drive. 3. Pick a lug each of tomatoes for the yellow hut stand. 4. Pick a lug of young corn. 5. Pick a lug of butternut squash. 6. Pick okra if it wasnt done yesterday. 7. Bag onions, don't bag the really big ones we will sell them individually. The well is 25 ft deep.The drip tapes emit about a gallon per row per hour..so I will have to check that, they seem to do more than that. 1. If there is corn in the cooler put it out on the trailer, if not go get two lugs of corn at the south edge of the field, the new corn, pick thin ears..we had some last night, it was sweet and perfect. 2. Pick red globular tomatoes for the stand. 3. Do some exploratory carrot digging both in the upper field near the rhubarb and in the willow field. I am hoping you will find 12" long carrots..no more 6" ones wanted. Dig two lugs of perfect large carrots. Put them in the gray cooler with towel. 5. I turned the water pump off so the well can get recharged, I will turn it on again today. Give chickens water, give them corn and tomatoes. 6. Pick up squash, put in the scale shed in lugs. 1. Move irrigation to new rows. 2. See if we can irrigate the new basil and broccoli in the upper field. 3. Pick globular red and yellow tomatoes, drive the van down the row to the large red follow my tracks. 4. I think I left the Yukon gold potatoes on the wash stand. Go ahead and wash them, discard all the damaged spuds , put them on the counter of the yellow cooler. 5 .Pick three lugs of plum tomatoes. 6. Pick up ripe butternut squash at the willow tree put them in the scale shed next to the refrigerator with the others. 7. You can always clean up onions in the greenhouse. Pull the tops off and slough off the outer loose skins, a few seconds each, nothing like the exquisite peeling we did a week ago. Put them in red onion bags with at least five lbs in each. Red onion bags are on a bench in the greenhouse. Stuff the bags at the table in front of the yellow hut so you can easily weigh them. Big white ones stay loose at $1 apiece. Stack the onion filled lugs in the scale shed too next to the squash. 1. Are two lugs of carrots harvested? Only perfect ones. 2. Pick a tub of rhubarb. 3. Harvest two lugs of washed, rubber banded bok choy. Remove all ugly leaves, cut stem off. Put them with towel in the grey cooler over night. In a separate lug give connie bok choy for tonight's dinner. 4. Separate large globular tomatoes from smaller lemon sized ones. Given the chance people do not select little ones...just look at our sales counter at the yellow shed. 5. We must bring at least 6 lugs of globular red and yellow PERFECT tomatoes to the market. Be sure they are clean, put them in the yellow van IN THE SHADE over night. 6. Two lugs each of kale and Swiss chard. 7. Turn drip tape on for a spinach row that needs it. FYI I will order more spinach seed in case the three rows we planted don't germinate..it was too hot and according to google they won't germinate in hot soil. 8. We need two lugs of leeks. Cut the roots off, i will show you how I want the tops trimmed. Call me when you are ready for me to show you. 9. Of course pick up ripe muskmelon and watermelons, including yellow watermelons. Overnight. Be sure they are clean before packing them. 11. Pick four perfect lugs of silver queen look now for younger ears that have smaller kernels. You can tell that by feel when picking, corn should be hard not soft, soft means there are rows missing. Put the corn in the gray cooler immediately after picking...keep them cold! 1. Have all the onions been pulled? Pull them up and lay them on the black plastic to dry.do this before the stems dry out and die,much much easier to do. 2. Pick ripe melons, pick four more watermelons get them from the UNIV drive farm do not allow them to roll around, they will break! 3. Pick three lugs of corn for the yellow hut table. DO THIS FIRST. 4. Pick cukes and small zukes. 5. Prepare the potato field for spinach planting. 6. Weed the parsnip and other crops under the white cover in the willow field. Not in the gray lugs since they were squished last week. 3. Cucumbers, perfect zukes one lug of each, load them. Load also any haricot vert you can find check the willow field under the cover. Load them. 6. Spaghetti squash two lugs clean them and load them. 7. Eggplant and peppers load them all. Pick more classic eggplants at UNIV drive. 8. Harvest kale, chard, carrots, wash them and put them in the gray cooler a full lug of each. 9. Nice work on the perennial bed, carry on. 10. Continue to harvest all onions that are big enough...size of an orange..do not trim just dump them and spread them out on the greenhouse benches to dry.we will do those a little at a time till they are all harvested. Drive the full lugs of onions to the greenhouse. 11. Any cute cabbage, cute means you have stripped all the dark leaves and cut the stem flush, we need four of them for the market. 1. Using a rototiller, please rototill the perennial rows. To make the tiller go put the right hand gear shift into gear will show you how to do that. Then please hoe twenty feet of row every day till the rows are clean of weeds . There are three rows. 2. Please check the products at the stand, throw away all old stuff immediately. Throw away the little tomatoes that are left when customers just select large ones inside and outside the shed. Do not bring in from the field little globular tomatoes they are worthless. Nobody likes to select the dregs, the items that others have passed over. 5 Pick another lug of onions to dry in the greenhouse . 6 My colleague has the farm car, his car is being fixed. 7 Somebody make a start at weeding the new strawberry row. Do a bit every day. 8 Be sure to pick cantaloupe every day both farms. 1. Rototill, hoe and weed at least 20' of a perennial row in front of the shed today. 2. Pick two lugs of corn..you have to look and select the fat ones. Strip one and wrap it in Saran wrap so customers will see that it is white "silver queen" corn. Put one lug on the counter outside the yellow hut. Make room by consolidating the two lugs of onions into one. 3. Pick ripe muskmelons. I saw some gleaming at me as I drove by the willow field last night. 4. Pick a lug a day at least, of onions. Just pull them up and dump them on a bench in the greenhouse where they will dry. Don't trim them. 5. Weed the new strawberry row. Very important! 6. I will make signs for silver queen corn. 7. Pick some perfect globular tomatoes for the yellow hut, I will make a sign directing people to the tomato rows so they can pick their own. 8. The okra needs to be picked in the upper field. 9. Cultivate all the aisles with the red tractor. 1. Hoe the kale at UNIV drive. 2. Hoe and rototill the perennial rows in the upper field near the shed. 3. Pick a lug of red onions. 4. Keep the yellow shed inside and outside clean and stocked. Put prices on everything. 5. Keep all displays full, no half empty displays. 6. Dig a lug of carrots for the yellow shed display. 7. Pick perfect globular tomatoes. 1. Pick okra at UNIV drive. 2. While there, hoe the kale, weed it. 3. Pick a lug of plum (Italian) tomatoes, we will use that to sell a full five gallon bucket $20. 4. The squirrels have won, put ALL the tomatoes in the yellow shed. 5. Check the globular tomatoes, display them in lugs one tomato deep all looking up, do not keep any with spots, cracks holes they must be PERFECT. The small gray lugs are too shallow and they have crushed some, so use bigger lugs. 6. We didn't sell many zukes last Saturday, so don't bother picking them, do pick cucumbers. 7 Try repairing the covering over the Brussels sprouts. The deer eat from top down. So be sure the covering covers the tops of the plants. Look at the ground and see if there are fresh deer prints, let me know. 8. Pick a lug of red onions, they don't have to be refrigerated. 9. Pick ripe muskmelons, they must be refrigerated. 10. Encourage all customers to pick their own. If they take a pail ask them to return it. Finished harvesting the potatoes and picking up the associated plastic mulch. We wonder if there are more potatoes under the surface since we relied on the red cultivator to surface them. Bob thinks the single bottom plow set about 8" deep should be tried next. 1. I will be there about 830 am, today, to help unload the several full lugs from the van. We will store the potatoes, unwashed in the gray cooler, we will clean them one lug at a time as they sell. We have several hundred lbs of potatoes. 2. Take out the plywood floor of the van and sweep it out. So it will be ready to be loaded for the market tonight and tomorrow morning. 3. Harvest watermelon. The yellow melon and large red ones at UNIV drive. Put them in lugs so they don't roll around. 4. I don't know what has not been done: cilantro planted? Repair deer covers over the Brussels sprouts? Has a special feeling for the "doubles" so leave a few cute ones in . 6. We have some damaged potatoes, bring a lug to the market to sell as IRREG. Connie notes there is a growing market for them, you can even order IRREG seeds now, (every carrot will be imperfect but loved) those that don't sell will be boiled up ..preferably at the farm over a wood fire...and fed to the chickens. 7. Put on the blackboard what has been harvested and the number of lugs. 8. Pick tomatoes...all of them..let me know by five if there are more to be picked and which kind. Don't mix the plums with the globes with the cherries. Plums and cherry tomatoes can be put in a big lug, they don't crush. Globes are put in small gray lugs one deep. Only perfect ones again. Ugly tomatoes can be fed directly to the IRREG chickens. 9. Pick cukes, eggplants, peppers ,spaghetti squash... no "winter" squash ...they don't sell in summer in fact they make some people, who haven't vacationed yet, mad. 10. Chard and kale a full trimmed, washed lug of each. 11. I will pick basil Saturday morning at 8:30. 12. Pick onions, be sure all the white ones have been harvested, leave them at the wash stand for the frolicking volunteers to process tonight at five: 1" stems sharply chopped, skinned a bit and very clean. 13. If there are beets get them. Otherwise I can't lift it. Tonight more potatoes will be harvested..I will remember to order more white bags too. I recommend that anyone who desires a long uninterrupted sleep come help harvest the next row tonight. 1. Plant cilantro seeds in the plastic between the basil planting in the upper field. 2. Harvest ripe muskmelon at the willow field and the 100 UNIV drive field. Don't let them roll around in the van. 4. When you pick tomatoes use the small gray lugs one row high, do pick tomatoes. 5. Check the yellow cooler that every thing is looking good, is clean, attractively displayed and priced. Remove old stuff , put it in the compost pile. The volunteer group will wash them tomorrow night. As well as carrots. We harvest eggplants tomorrow to give them a other day to grow! Dunstun variety purchased from Chestnut Hill Farm in Alachua Florida. 92% American chestnut 8% an Asian variety with resistance to the blight. We have several hundred lbs, all shucked and stored at 38 degrees. $4/ lb you pick up. If we ups them to you the shipping cost will be additional. Call Bill’s cell or email for further instructions/ information.